1. Slave of Gamaliel II., known for his acquaintance with the Talmudic laws and for his piety; mentioned in several instances in the Mishnah. During the Feast of Tabernacles, Ṭabi used to sleep under the bed in the booth. In allusion to this habit Gamaliel observed, "Ṭabi, my slave, is a scholar; he knows that the law of booths does not apply to slaves, and therefore he sleeps under the bed" (Suk. ii. 1 [20b]). Yet Ṭabi used to wear phylacteries, a duty and privilege of free men; but, his piety being known, he was not interfered with (Yer. 'Er. x. 26a). Wishing to free him, but unable to do so since it would be contrary to the Law, Gamaliel, ostensibly by accident, put out one of his slave's eyes; then, meeting R. Joshua, he expressed his great joy at having found occasion to free his slave (comp. Ex. xxi. 26-27). Joshua, however, told him that he was mistaken, since no witnesses had been present and since he had confessed to the act himself (B. Ḳ. 74b; comp. Yer. Ket. iii. 28a). When Ṭabi died his master received condolences from his friends, a rare occurrence in the case of slaves (Ber. 16b). It is said in Azariah da Fano's "Gilgule Neshamot" (s.v. "Gamaliel") that Gamaliel's soul emanated from that of Shem, while Ṭabi's soul emanated from that of Ham, who was destined to be a slave to his brother (comp. Gen. ix. 25). Besides, according to the lesser numerical values ("mispar ḳaṭon") of the letters of the alphabet, the names of Ham and Ṭabi both have the same numerical value, namely, twelve. 2. Amora of the third generation (third and fourth centuries); mentioned in both Talmuds as transmitting halakot of R. Hamnuna (Yer. Suk. iv. 1), of R. Ḥisda (Yer. Shab. iii. 1), and, more often, of R. Josiah (Ber. 15b et al.). 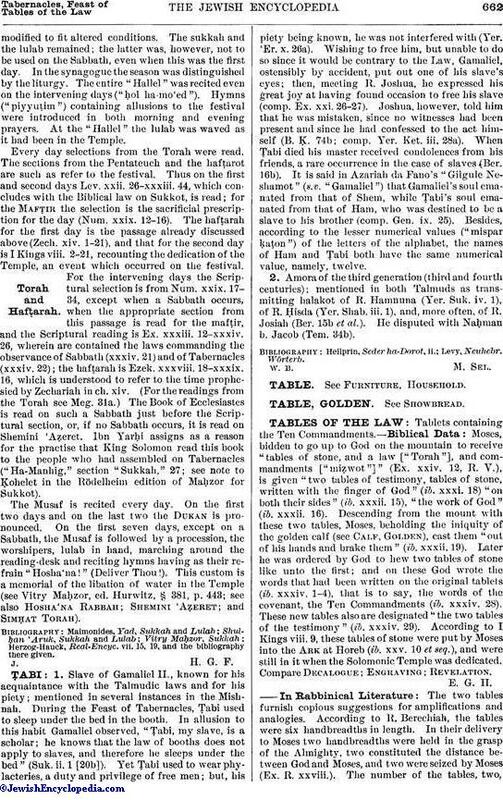 He disputed with Naḥman b. Jacob (Tem. 34b).